Having a beach wedding is one of the top wedding destination ideas and has been for a long time. Many brides dream of a beach wedding for many reasons, and we don’t blame them. Starting your new journey with the love of your life in paradise seems like the perfect marital recipe to us. As you may know, you can have a dream wedding right here at Beacher’s Lodge. We provide the beautiful backdrop of the sand and ocean as well as a reception room that easily accommodates 50 guests. After the celebration, guests and the wedding party can retire to condos with balconies that overlook the beautiful Atlantic ocean. 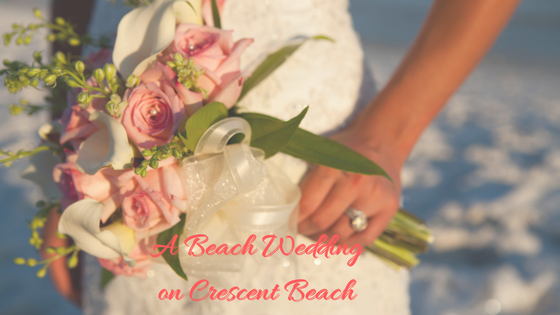 If you are thinking about having a beach wedding and wondering why so many brides choose Crescent Beach for their wedding destination, no worries! We’ve come up with a list of reasons why brides love Crescent Beach for their wedding day. No shoes are required. Your traditional wedding usually requires shoes that are not very comfortable for an all-day affair. That includes both wedding parties. A beach wedding is best enjoyed barefoot. Guests and the wedding party can be more casual. Imagine how much money you can save by having the wedding party in shorts or sun dresses instead of having them spending hundreds of dollars on tuxes and fancy one time worn evening dresses. The guests will love it too because they can wear something more casual and not have to worry about going to Macy’s to find that perfect wedding outfit that will probably be worn only once. A beach wedding is perfect for smaller ceremonies. You don’t have to worry about filling up a large venue, or if more folks show up than expected because on the beach, there’s plenty of room for everyone. The reception is less chaotic. What do we mean by that? The perfect example of a less chaotic reception was one that we had a few weeks ago. The ceremony included 20 guests and a wedding party of 6. They held their ceremony on the beach and then had their reception in our banquet room. They had their favorite restaurant cater the event and used an Amazon Echo as their DJ for wedding music. It was simple and fun. It’s affordable. The permit to have a beach wedding doesn’t cause much pain to your wallet, especially when you compare it to some other extremely fancy venue locations. Plus, guests love it when they don’t have to travel between venues. Beach weddings and receptions often take place right next to each other, so it’s really difficult to be late! You can get ready in your condo. Then, you walk down to the beach and say, “I do”. Afterwards, everyone walks back up to the banquet room and has the time of their lives as they celebrate the couple. Once the party is over, everyone can go back to their condos and sleep it off. The car never leaves the property parking lot. These are just a few reasons why so many choose Crescent Beach to say, “I do,” and start their lives together. There are many more, but we’ll save those for another blog post. If you would like to say, “I do,” or “I would be more than happy to say ‘yes’ all over again.” Beacher’s Lodge has the perfect beach spot for you!